Chandigarh, Aug 25 (UNI) Moderate rain pounded many areas in the north-west region as monsoon remained active in Punjab and Himachal Pradesh during the past 24 hours. The Weather Office has warned of heavy rain at isolated places in Himachal Pradesh, north and north-eastern parts of Punjab and north-eastern parts of Haryana during the next 24 hours. Moderate to heavy rain lashed several areas in Punjab with Ludhiana turning the wettest place recording 33.2 mm rainfall till this morning. Patiala measured 28.0 mm, Nangal Dam site 27.5 mm and Balachour 4.1 mm. Several areas in Haryana also experienced moderate rain. Kalka recorded 30 mm, Naraingarh 27 mm, Faridabad 25 mm, Jagadhri 14, Ambala 13.6, Shahdbad and Pheowa six mm each and Panchkula five mm. Moderate rain also lashed parts of Himachal Pradesh, including mid and lower hills, triggering fresh landslides. All rivers, including the Beas, Sutlej and the Ravi and their tributaries flowing through the state were swollen. Una was the wettest place in the state, recording 55.8 mm rain till this morning, followed by Dharamsala registering 44.6 mm, Barthin 32.5 mm, Bhang-Manali 22.4 mm Sundernagar 20.9 mm, Solang Nullah 17.6 mm and Sujanpur Tira 13.2 mm. Naudan, Bhuntar, Rampur, Suni, Kasol, Kahu, Guler, Gamroor, and Dhundi areas also experienced rainfall. 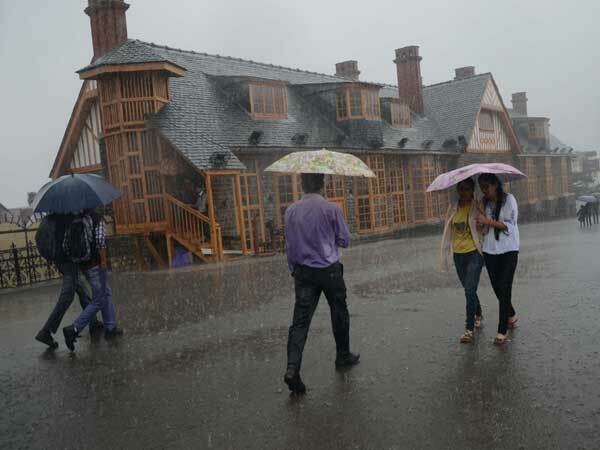 The capital town of Shimla recorded 1.5 mm rain till this morning. Rains also lashed Jammu region and the winter capital of Jammu and Kashmir recorded 5.2 mm. Chandigarh and its adjoining areas also had moderate rainfall since last night, giving relief from hot weather conditions. The city recorded 28.0 rain till 0830 hours.